I really love the beach. But in recent years you would’ve found me going there less and less and rather opting for some pool time instead. Why? Well thanks to the traffic & parking hell you have to endure to actually get to one of our main beaches (I’m specifically referring to Clifton / Camps Bay). 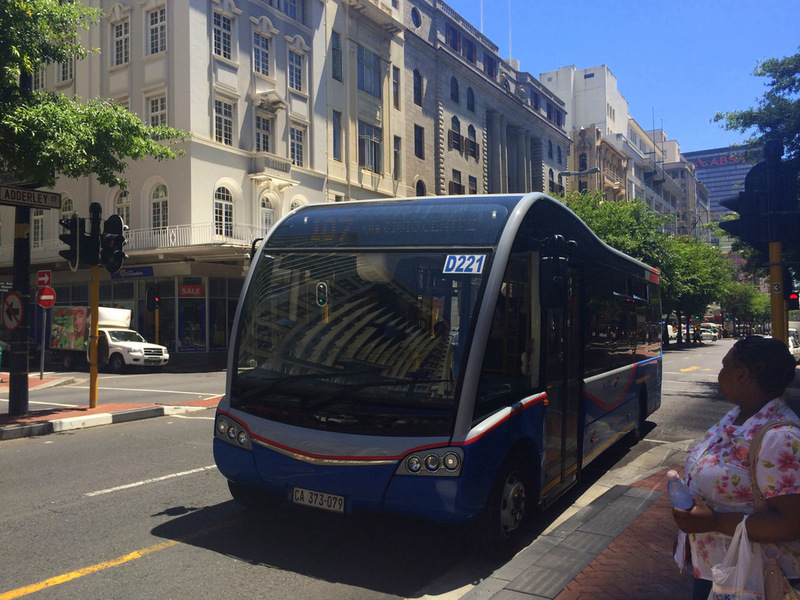 But now we have the MyCiti bus system which has opened new routes including ones which will take you all the way from the city centre to Camps Bay in about 23min flat. How great is that? I’m a MyCiti Airport bus regular and it really is the easiest way to get to/from the airport, but I hadn’t tried any of the other local routes until recently, and now I am totally hooked. This will now be the way I get to the beach during the crazy summer season, that’s for sure. I was very impressed. This is the same as what you’ll see overseas when using public transport. Very slick. 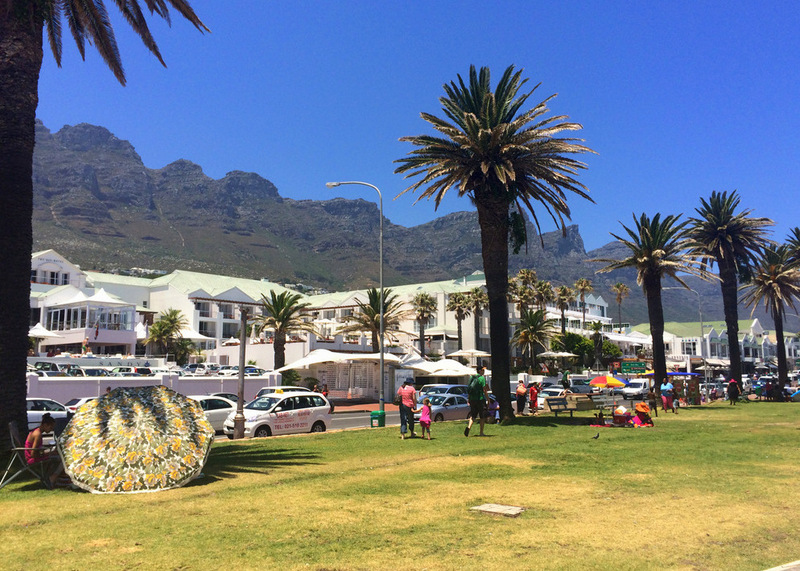 The bus I took was the 107 (dark pink route), but you can also take the 106 (dark blue route) from the same stop to also get you to Camps Bay, that one just has a few extra stops. The 107 passes by every 15min during peak times and every 30min during off-peak (or saver) times. Inside a digital display shows you what the next stop is. And you can press the stop button just to let the bus driver know that you want to get off at the next stop. Just a tip – if you’re standing alone at a stop, put your card up for the driver to see, cause if they don’t see people waiting and there’s nobody wanting to get off, they’ll skip a stop. You have to tap this card in and out with every trip and of course you have to pre-load money on it (you can’t load money on it on the bus). 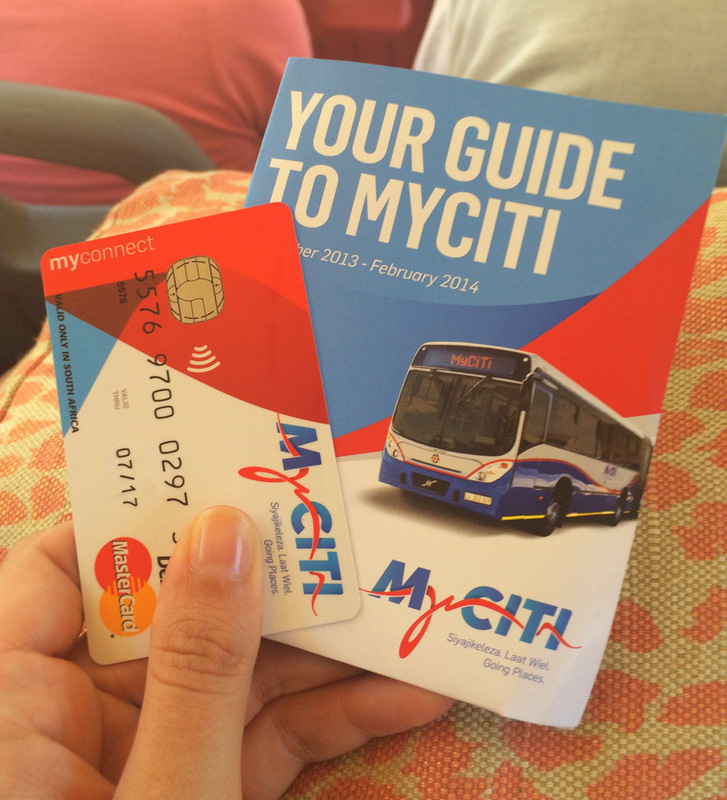 Also good to get is one of these MyCiti Guides. 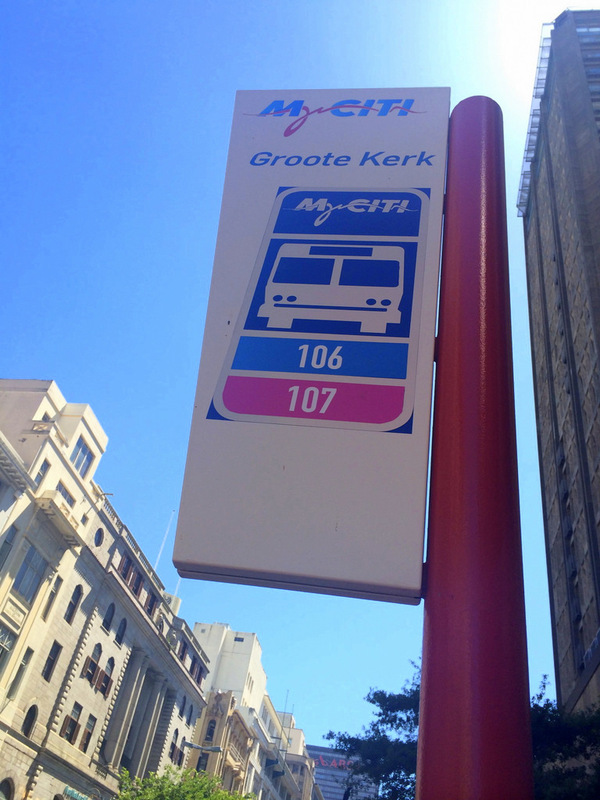 MyCiti cards can be purchased at MyCiti Station Kiosks all around Cape Town. This is also where you can top up your card with more monies & get your hands on discounted Mover packages (there’s a 2.5% – 3.5% admin charge when you load your card, but this is waived with a Mover package which starts from R80 up). Check out this page for info on the station kiosk locations and opening times. 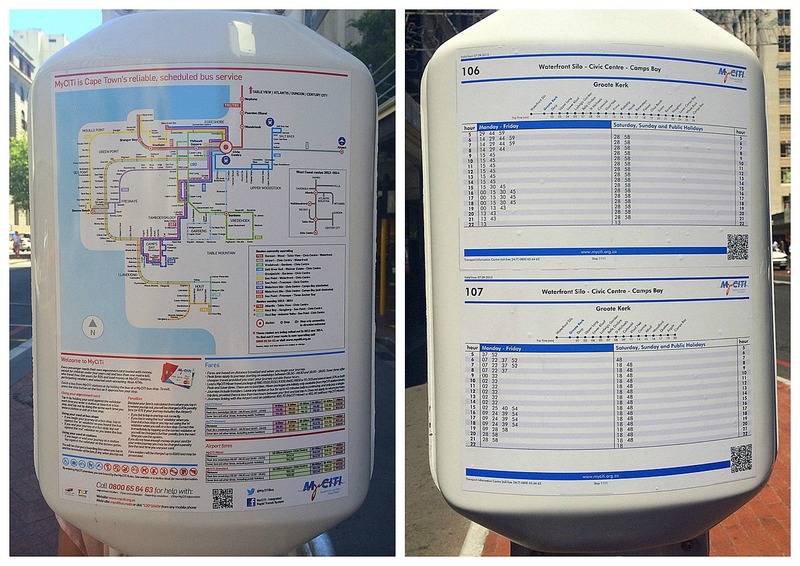 Taken from the MyCiti website as at 4 Jan 2014 – always check the website for the most up to date fare info. You can also download & view route map info over here and timetable info over here (the Camps Bay route runs till around 10pm for example). 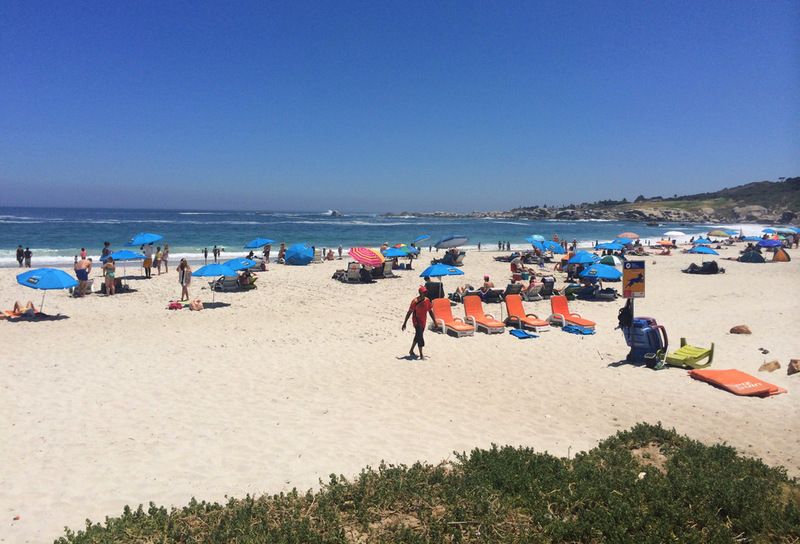 There are various CBD & Atlantic Seaboard routes, the Camps Bay routes, as well as a routes from the Melkbosstrand/Table View/West Beach/Big Bay/Parklands areas and then of course that great airport bus. Coming in 2014 are routes to and from Hout Bay & Atlantis too. That’s all very exciting indeed. I really wouldn’t mind an easy bus trip to Hout Bay market every Sunday. And just think, now you can enjoy a couple glasses of wine and maybe a cocktail or two without any stress about who’s gonna be the designated driver. High fives all round to that. 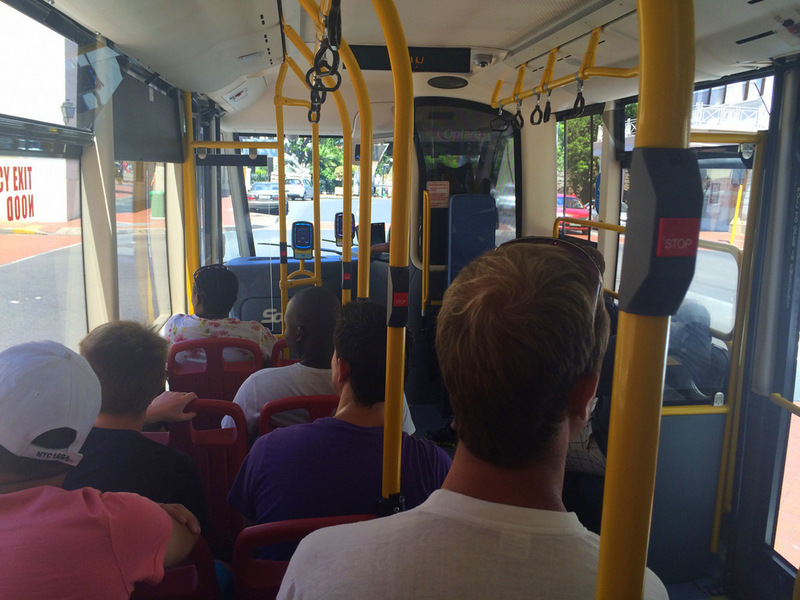 My friends are visiting CT and they are lurving the MyCiti bus, they are saving moola by not using cabs. I know, a cab ride in comparison would have been super expensive. This really is the only way to go that’s affordable and easy. Thank you so much fr sharing. It’s helping me plan my trip and saving me money!